RE: Dont let friends drive your $1500 cars. I mean for real dude why the hell would you do that ??????? BAH, little bondo, and a BFH and your golden. I know how you feel, my buddy painted my FG MT, and then ran into my dads truck with it.. I learned a lesson. Thats why they make 1/10 scale-to loan out. Never the 1/5 to any one. One time I was outside my LHS testing out my buggy. Some 16yo kid walks up to me, said he knew me from my neighborhood(never seen him before). He said that his brother has 5 5th scales and lets him run them all the time. He also has his own 10th scale and runs it sometime with his brother. Then comes the question, "yo man can I run ur car"? So my answer was if u have $1000 in ur pocket to give me right now, I dont think so ! Now tell me this kid didnt get an attitude with me and walk off like a 5 yo(lol) ! ! ! !! yeah,I was stupid. I generally let the friends use my electric monster trucks and stuff. It hit the tire of a backhoe loader at 30 mph. I hate letting people drive my rc's. What kind of bumper do you have on your Baja? That's pretty cool. I tell them "sorry, I can't, it is an insurance liability". Then there are those who usualy look at me funny, laugh and say " No seriously can I try it " ? and I tell them "no, as it is a potentialy lethal weapon, and only I have a license to kill." Because I'd kill them if they broke it. Actually daveESPI has an interesting point - since it IS an insurance liability. 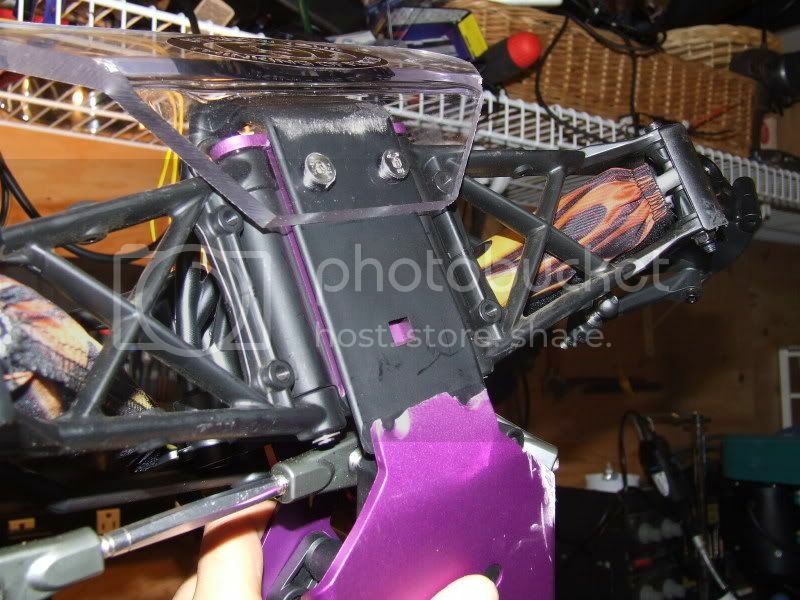 If they drove my RC car into a 3rd parties property and damaged it, it would be a nasty situation to be in. Speaking of the bumper, i WISH it had taken some of the impact, but its in perfect shape...the chassis just died under it. It is a cool looking one though. Yeah i kinda came close to an incident like that.. I was at a local park and running my truck up and back wot throttle runs.. Man this little kid on a bike came out nowhere and was just sitting in the path of my truck, i guess just amazed! he could've only been but 7-8 years old.. So here i come wot down the huge parking lot and luckily i just notice him. i had to turn and roll my truck to prevent from hitting him... I know i would have been in big trouble and he would've been seriously injured on that little bike. But yup broke the screw in my front upright and that was it... I put that sucker in the trunk and said the hell with that. 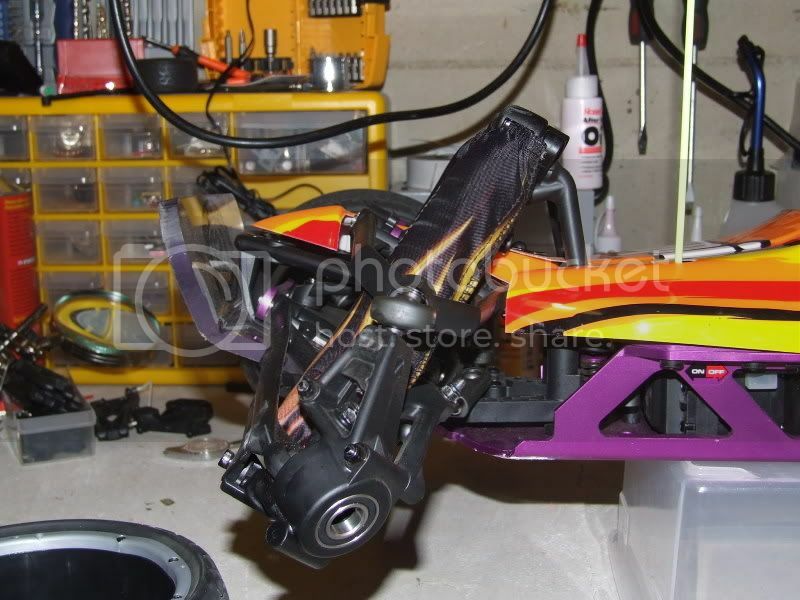 Yeah, RC cars (even smaller scale ones) can really hurt someone. I once almost hit someone on a bike with my Jato 3.3 WOT...wouldnt have been good for either party involved. Just the other day, my battery came loose and it drove off, not wot maybe only 15-20 mph, but it went across the street and into the neighbor's yard and hit their porch step. The thing is: They have a lot of children that play in the yard. But luckily for me none were out and no one came out to yell at me. I felt really lucky that no children were hurt. Im actually pretty paranoid generally about where I run my cars, though its hard to find places that have NOTHING you can damage. The thing is that...I always let people drive my cars. I don't know why but i do. Even my FG evo. But not to a total strangers, i mean like friends and family. But i only let them drive it once for 5 min and that is it...so they can just get an idea of it. I always tell them...take it slow. Some listen and some don't. They watch me drive, and then when i give them the controller, they try to drive just like me, i am like dude, i been driving for years, you just got the controller and you want to be just like me. And unfortunately people crashed my cars many times, just the other day buddy of mine was driving my Jato 3.3...i told him to bring the car in so i can fill up some gas...he comes...pretty fast...hits the brakes hard, car looses control he freaks out and pulls the trigger as hard as he can...straight to a curb at really high speed. Now i am gonna stop letting people drive...its not the cost of parts, i don't care about the money. Its the time and effort to put in it to take it all apart and put it back together...i enjoy it, but its a pain. Specially when you get new plastic parts, and the plastic does not have screw threads on it, so its like first time putting a screw to the plastic...and what happens is that it gets to tight and i end up stripping a screw head...and now i have to take that out, and go get new screws. Even when i go to a BIG smooth parking lot...people still manage to crash by flipping it over. So the only safe way is to not let anyone drive.